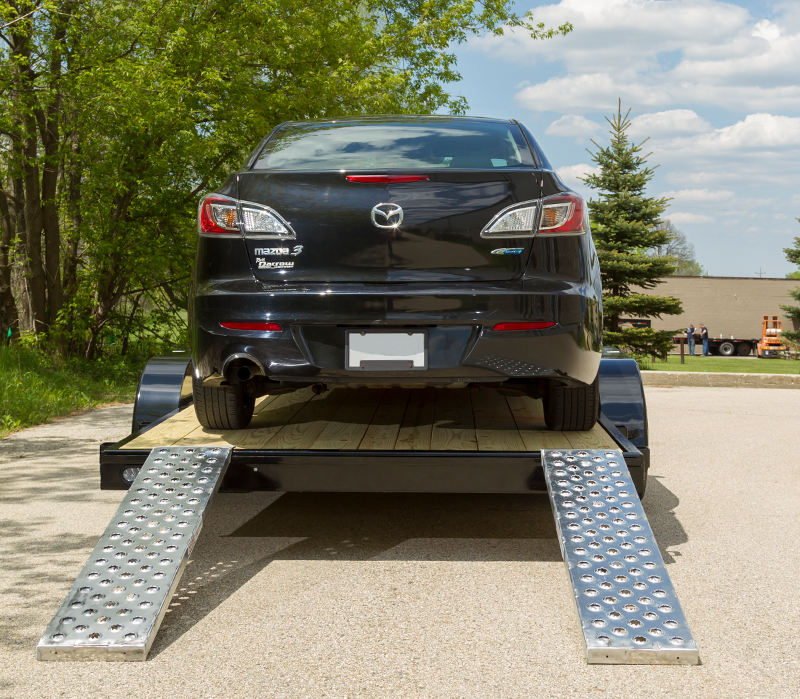 Our auto loading ramps are the strongest, lightest, and best engineered in the industry! The ramps are constructed from military grade aluminum alloy making them stronger than the standard aluminum used by other manufacturers. We stock commercial ramps in lengths from 4’ to 16’, and capacities ranging from 2,500 lbs per axle up to 12,000 lbs per axle. Our most popular auto ramps are 5,000 lbs per axle. Custom lengths and capacities are available upon request. The auto ramps are available in 2 traction surfaces – serrated cleats, and our proprietary EZ punch plate traction surface. The EZ traction surface offers the best traction in the industry and will provide superior grip in any weather conditions including rain, snow, mud, and ice. 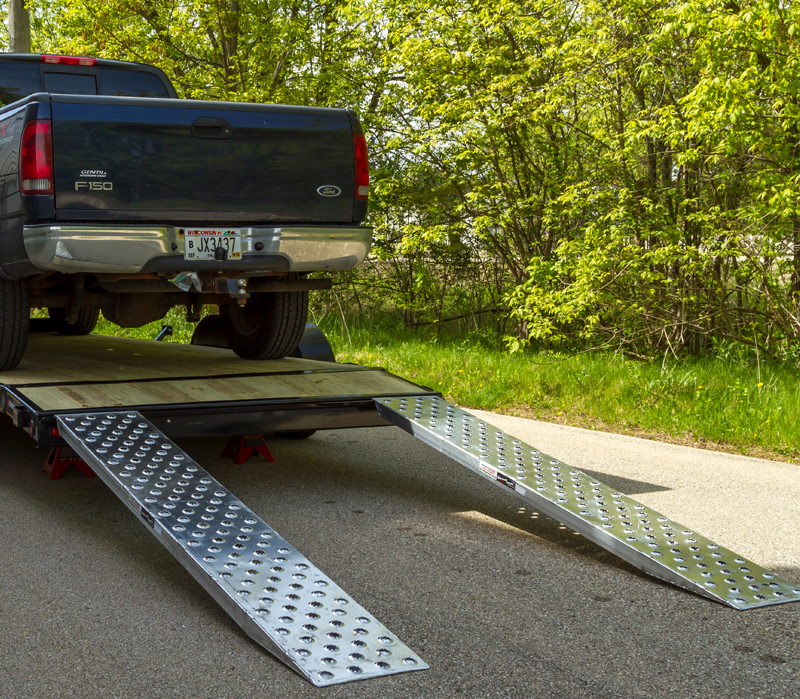 To secure the ramps to your trailer or vehicle, we have four connection end options: hook end, flat plate, pin-on, and a hybrid hook/plate combo. The hook ramps simply hook over the trailer rub rail – or any flat bar connection point or round bars up to 1-1/4” diameter – to secure the ramps to the trailer. 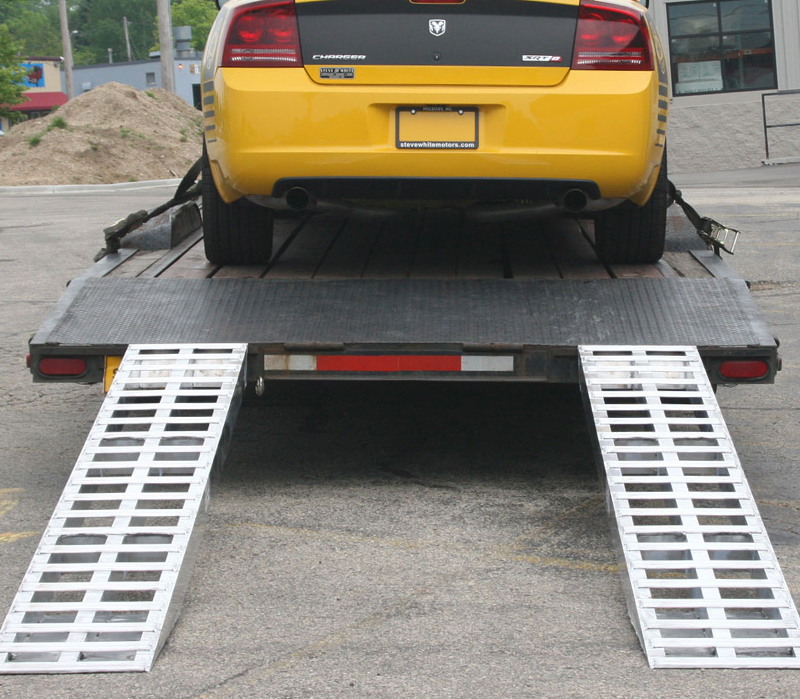 The hook ramps are our most popular style of auto ramps. The hybrid hook/plate ramp connecting end is a combination of a plate and hook. This feature allows for maximum versatility when connected onto different trailers/vehicles. 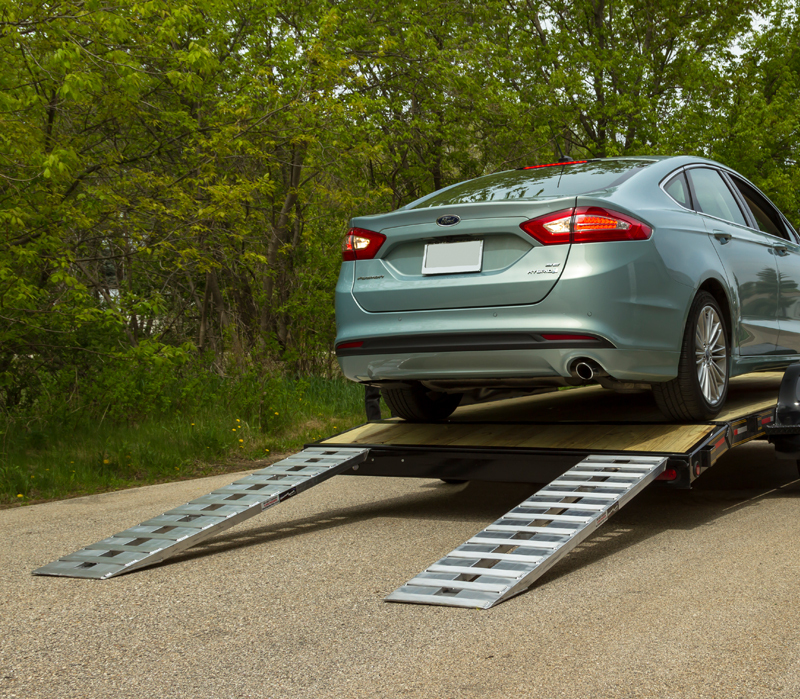 The 3-3/4” long flat plate connecting end can be used on any flat surface while utilizing the included safety straps to secure ramps to vehicle. The underside of the flat plate end has rubber padding to provide superior grip and prevent scratches to your vehicle’s paint. 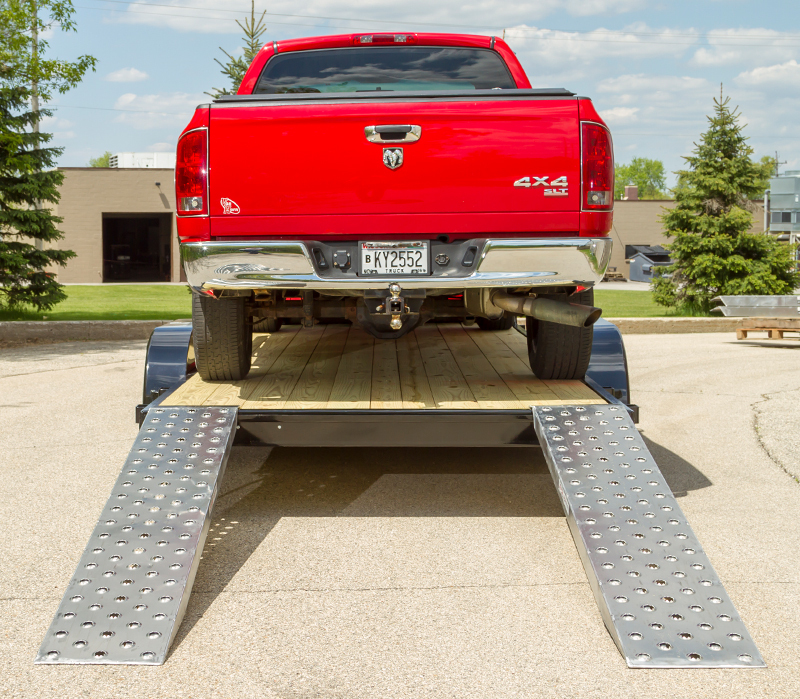 The pin-on ramp option is the safest way to secure ramps to any trailer or vehicle. This requires an attaching bracket called a skid seat to be welded to the vehicle or trailer. Once the bracket is installed, the pin-on ramp end drops into the skid seat and a ¾” steel rod slides through the ramp end to secure it safely to the vehicle. The plate ends are a very versatile connecting end. Flat plate ends have PVC rubber strip bonded to underside. Safety straps are included and are required when using ramps. The flat plate ends will NOT work on beavertail /dovetail trailers. Two different ramp lead up “foot” options are available: knife cut and stub toe. The knife toe is the most common for auto ramps and provides the smoothest transition onto the ramp.